Perfect for every day or on Stage for "My First Recital" Ages 3-6. Every stage product you need! 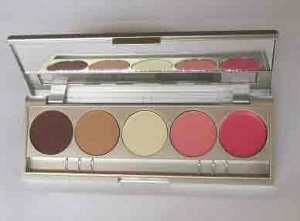 Colors: 3/Eye shadows in Burgundy/Plum (define/Line), peach (Balance) and golden white shimmer (Highlight), soft pink Cheeks and long lasting pink Lip Cream all in one compact. Adorable with pink, white and black tutus! LIPSTICK Ricinus Communis (Castor) Seed Oil, Octyldodecanol, Candelilla Cera (Euphorbia Cerifera (Candelilla) Wax), Glyceryl Ricinoleate, Oleyl Alcohol, Copernicia Cerifera Cera (Copernicia Cerifera (Carnauba) Wax), Cera Microcristallina (Microcrystalline Wax), Caprylic/Capric Triglyceride, Paraffinum Liquidum (Mineral Oil), Cera Alba (Beeswax), Cetyl Alcohol, Tocopherol, Parfum (Fragrance) and may contain: [+/- Titanium Dioxide CI 77891, Iron Oxides CI 77491, CI 77492, CI 77499, Yellow 5 Lake CI 19140, Red 36 CI 12085, Blue 1 Lake CI 42090, Carmine CI 75470, Red 22 Lake CI 45380, Red 7 Lake CI 15850, Red 40 Lake CI 16035, Yellow 6 Lake CI 15985, Red 28 Lake CI 45410, Manganese Violet CI 77742, Bismuth Oxychloride CI 77163, Mica, Silica, Tin Oxide, Alumina, Synthetic Fluorphlogopite] (EU seulement/only: CI 77007, CI 77120, CI 77266, CI 77510, CI 77000, CI 58000, CI 77288, CI 74160, CI 77289, CI 73015) May contain carmine as a color additive. CHEEK COLOR Talc, Dimethylimidazolidinone Rice Starch, Mica, Aqua (Water), Magnesium Myristate, Propylene Glycol, Octyldodecanol, Isopropyl Myristate, Glyceryl Stearate, Phenoxyethanol, PEG-150, Ricinus Communis Oil (Ricinus Communis (Castor) Seed Oil), Silica, Cetearyl Alcohol, Quaternium-26, Methylparaben, Glyceryl Ricinoleate, Ethylparaben, Cera Carnauba (Copernicia Cerifera (Carnauba) Wax), Candelilla Cera (Euphorbia Cerifera (Candelilla) Wax), Sodium Cetearyl Sulfate, Stearic Acid, Propylparaben, Cera Microcristallina (Microcrystalline Wax), Tetrahydroxypropyl Ethylenediamine, Paraffinum Liquidum (Mineral Oil), Cetyl Alcohol, Cera Alba (Beeswax), Benzyl Salicylate, Linalool, Butylphenyl Methylpropional, Hexyl Cinnamal, Alpha-Isomethyl Ionone, Coumarin, Eugenol, Amyl Cinnamal, Limonene, Geraniol, Hydroxycitronellal, Citronellol, Parfum (Fragrance) and may contain: [+/- Titanium Dioxide CI 77891, Iron Oxides CI 77491, CI 77492, CI 77499, Ultramarines CI 77007, Ferric Ferrocyanide CI 77510, Chromium Oxide Greens CI 77288, Carmine CI 75470, Manganese Violet CI 77742, Chromium Hydroxide Green CI 77289, Bismuth Oxychloride CI 77163, Yellow 5 Lake CI 19140, Red 40 Lake CI 16035, Blue 1 Lake CI 42090, Red 22 Lake CI 45380, Red 28 Lake CI 45410, Red 7 Lake CI 15850, Red 36 CI 12085, Yellow 6 Lake CI 15985] (EU seulement/only: CI 73015, CI 77120, CI 77266, CI 58000, CI 74160) May contain carmine as a color additive. MATTE EYESHADOW Talc, Dimethylimidazolidinone Rice Starch, Mica, Aqua (Water), Magnesium Myristate, Propylene Glycol, Octyldodecanol, Isopropyl Myristate, Glyceryl Stearate, Phenoxyethanol, PEG-150, Silica, Ricinus Communis (Castor) Seed Oil, Cetearyl Alcohol, Quaternium-26, Methylparaben, Glyceryl Ricinoleate, Ethylparaben, Copernicia Cerifera Cera (Copernicia Cerifera (Carnauba) Wax), Candelilla Cera (Euphorbia Cerifera (Candelilla) Wax), Sodium Cetearyl Sulfate, Stearic Acid, Propylparaben, Cera Microcristallina (Microcrystalline Wax), Tetrahydroxypropyl Ethylenediamine, Paraffinum Liquidum (Mineral Oil), Cetyl Alcohol, Cera Alba (Beeswax), Parfum (Fragrance) and may contain: [+/- Titanium Dioxide CI 77891, Iron Oxides CI 77491, CI 77492, CI 77499, Ultramarines CI 77007, Ferric Ferrocyanide CI 77510, Chromium Oxide Greens CI 77288, Carmine CI 75470, Manganese Violet CI 77742, Chromium Hydroxide Green CI 77289, Bismuth Oxychloride CI 77163, Yellow 5 Lake CI 19140, Red 40 Lake CI 16035, Blue 1 Lake CI 42090] (EU seulement/only: CI 15985, CI 73015, CI 12085, CI 45380, CI 45410, CI 15850, CI 77120, CI 77266, CI 58000, CI 74160) May contain carmine as a color additive. SHIMMER HIGHLIGHTER Talc, Ethylhexyl Palmitate, Mica, Magnesium Stearate, Zea Mays Starch (Zea Mays (Corn) Starch), Silica, Parfum (Fragrance) and may contain: [+/- Titanium Dioxide CI 77891, Iron Oxides CI 77491, CI 77492, CI 77499, Ultramarines CI 77007, Ferric Ferrocyanide CI 77510, Chromium Oxide Greens CI 77288, Carmine CI 75470, Manganese Violet CI 77742, Bismuth Oxychloride CI 77163, Chromium Hydroxide Green CI 77289, Yellow 5 Lake CI 19140, Red 40 Lake CI 16035, Blue 1 Lake CI 42090, Aluminum Powder CI 77000, Tin Oxide, Silica, Alumina, Mica] (EU seulement/only: CI 15985, CI 73015, CI 12085, CI 45380, CI 45410, CI 15850, CI 77120, CI 77266, CI 58000, CI 74160) May contain carmine as a color additive.